Autodesk, a global leader in 3D design and engineering software, hosted a major forum in Abu Dhabi where experts discussed the future trends in strategic sectors such as architecture and construction that will shape the UAE capital’s majestic skyline. At its annual flagship user event today, Futures’ Forum, Autodesk welcomed hundreds of architects, designers, engineers and digital artists from around the region to experience ‘the future of making’ at the Yas Conference Center in Abu Dhabi. The event focused on how future technologies will disrupt and change the way industry experts can showcase their evolving excellence to realize the goals outlined in the Abu Dhabi Economic Vision 2030 and UAE Vision 2021, said a statement from Autodesk. The first-of-its-kind event in Abu Dhabi comes after a successful inaugural launch held at the IMG Worlds of Adventure last year in Dubai, it added. Some of the topics discussed at the event included robotics, drones, additive manufacturing, reality capture, the Internet of Things (IoT), cloud computing and much more. 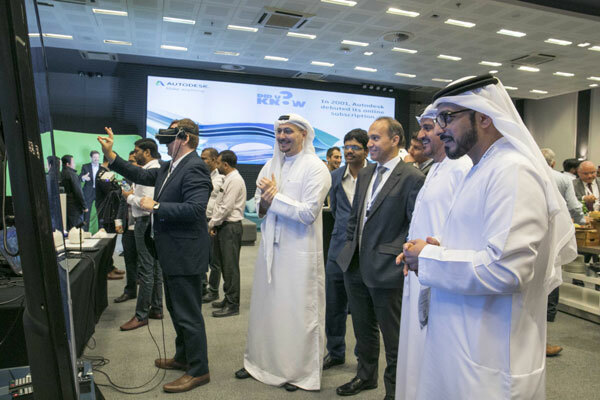 Emerging technologies like Augmented Reality (AR) and Virtual Reality (VR) were also highlighted throughout the event via multiple sessions and hands-on experiences. The event, known as the ‘Future of Making’ globally, has previously featured industry leaders whose endeavours embody the emerging future, including former President of the United States, Barack Obama and German Chancellor, Angela Merkel. Mohammad Saleh, the regional manager at Autodesk Middle East, said: "As the global population rapidly increases, it is evident we are facing the biggest challenge we have ever seen. There will be almost 9.5 billion people in the world by 2050, an exponential growth that we won’t be able to accommodate using today’s technologies. We must find different ways to build more with less, at a much faster rate." "I cannot think of a more fitting venue to explore and discover such ground-breaking technologies and innovations than at Yas Marina, most known for the Formula 1 Abu Dhabi Grand Prix – a representation of ultimate speed and agility of the most technologically-advanced sport around. As Abu Dhabi speeds off into the future, Autodesk looks forward to being there every step of the way," he stated. In line with Abu Dhabi’s core commitment to build a sustainable and diversified economy by 2030, Khalfan Alnoainmi, the executive director of Town Planning at Abu Dhabi Municipality, briefed the attendees about upcoming Building Information Modelling initiatives including the launch of BIM e-Submission and BIM e-review systems. These initiatives come as part of the recently launched Zayed Smart City Project, a five-year plan for Smart Cities and Artificial Intelligence, said the statement. The event wrapped up with a closing speech by Naji Atallah, Head of AEC and Manufacturing at Autodesk. "As a nation embraces the same vision for sustainability and future growth as Autodesk, we are quite proud to be a part of the dynamic growth the country has seen in recent decades," stated Atallah.